The Lenovo Phab 2 Pro, the world’s first Tango-enabled smartphone, is now available on shelves and online, and studios around the world are using the Phab 2 Pro as a working model to develop innovative Tango apps. As a result, the Phab 2 Pro will be delivering on the original Tango experience on a number of new apps, which have introduced unique AR and VR experiences to the phones of new Tango users. These include many high quality AR/VR games such as Hot Wheels Track Builder, Fury of the Gods or Crayola Color Blaster. At its core, however, Tango is a tool meant to make your phone more useful. 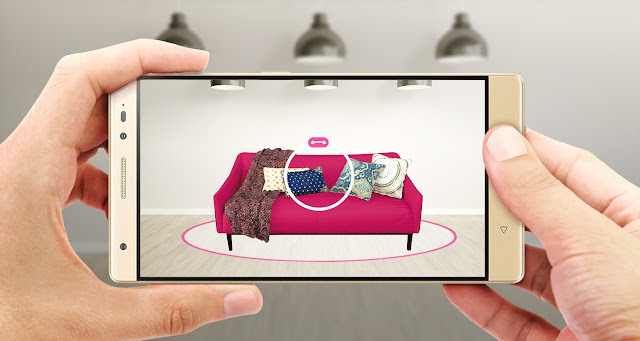 Take, for instance, the Phab 2 Pro’s preloaded Measure app, which uses Tango’s depth perception capabilities to quickly measure interiors and real world objects (and allows users to see the measurements displayed in augmented reality). And there are now a diverse range of retail, education and camera apps that promise to the re-imagine the way you use your smartphones. The retail experience is changing with Tango. Lowe’s and Wayfair have both showcased Tango apps that let users place actual-size furniture or home furnishings in their interiors before reaching a purchase decision, saving them on trips to the store. Users can view, walk around and examine these home additions through the screen of their Phab 2 Pro as if they were actually there. Another interior design app, iStaging, pairs the spatial perception features of Tango with its own Immersive Reality® technology to let users design their interiors right from the Phab 2 Pro. Users will have the opportunity to walk around the furnishings, floor tilings and even wallpaper they’ve chosen in their own homes to see if they fit. They’ll also be able to take pictures of the design to share with their friends or family. And if they can want to make a purchase, they can order the item straight from the app. iStaging offer products from a range of brands, including HomePlaneur, PIXERS, Arredoclassic and HOLA. iStaging’s Floor Planner app is also among a number of apps that allows designers and real estate professionals to measure and map their interiors. Matterport and its Tango software are allowing users to capture an accurate 3D model of an indoor environment, offering virtual house tours for people interested in a property. Meanwhile, Sensopia’s MagicPlan lets you measure your rooms and draw floor plans just by taking pictures. Tango also looks set to revolutionize education, with apps like Dinosaurs Among Us that allow viewers to walk among life-sized Velociraptors. Students can learn by exploring these virtual dinosaurs, where information referencing the latest research from paleontologists at the American Museum of Natural History is overlaid over various features of the dinosaur. Another educational app that’s perfect for the classroom or the home, Angstrom Tech’s Solar Simulator at Scale, lets teachers, parents and children project a scale model of the solar system into their living room, hallway or gym. The user starts by “placing” the sun at one end of an enclosed space in the real world—let’s say, the living room. Then the user moves to the far end of the room to place Neptune. Once that’s done, the app automatically scales the solar system to fit into your living room. Users and their friends can then walk among the planets in augmented reality, and find out just how far Saturn is from Earth. You can also film yourself and friends with a hologram of your favorite celebrity or character. The aptly named “Holo” mixed-reality app will soon be available from an exciting new studio called 8i. Holo allows users to add augmented reality holograms to real-world environments such as a living room or shopping mall. These holograms come in “holopacks,” comprising photorealistic 3D holograms of animals, celebrities, fictional characters, athletes and musical artists. Once you’ve added the hologram, move it around, resize or rotate it - then add as many holograms and virtual assets as you want to design your tableau. And when everything’s ready, get yourself and/or your friends into the picture to put on final touches. Then take a photo or record a video you can share with friends on Twitter or YouTube.